Manchester City vs Cardiff City, EPL 2018–19 Live Streaming Online: How to Get English Premier League Match Live Telecast on TV & Free Football Score Updates in Indian Time? Manchester City could get back to the top of the EPL charts as they welcome Cardiff City in a mid -week clash at home with the visitors in danger of getting relegated. Pep Guardiola’s men enjoyed a game in hand in a Premier League battle with rivals Liverpool and by the end of the 90 minutes at Etihad it would be clear of City have capitalised on it. The Reds thrilling last gasp win over Tottenham Hotspurs had put them on top but looks likely it will not be the case going into the weekend. Cardiff City boss Neil Warnock is hoping his side puts up at least a resilience against one of the best teams of Europe. Manchester City vs Cardiff City - Live Football Score. The hosts were dealt a blow when star striker Sergio Aguero was ruled out of the tie after picking up a nock against Fulham. Brazilian Gabriel Jesus will slot in place of the Argentine to continue the good work done by the Aguero. Kevin De Bruyne and Fernandinho should start for City who are also likely to start with Leroy Sane giving Raheem Sterling rest. Bernardo Silva has been one of the shining lights for Pep Guardiola throughout the season and could be a key against Cardiff City. City play a FA Cup semi-final on the weekend hence there could be few early substitutions. Neil Warnock had threatened to play his under 23 side against Manchester City after some angry moments at the end of the game against Chelsea were refereeing played a major role in their defeat. But that is going to be highly unlikely with their position in the league table and Warnock’s statement could very well have been made in the heat of the moment. In terms of team news Callum Paterson is out with an ankle injury and Sol Bamba is on the treatment table with a knee injury. Manchester City could rip apart Cardiff City on their way to moving the top of the English Premier League table. When is Manchester City vs Cardiff City, EPL 2018-19 Football Match? Know Date, Time and Venue Details. In the English Premier League (EPL), Manchester City and Cardiff City face-off on April 04, i.e.Wednesday mid-night. The football game will take place at the Etihad Stadium, with the start time of 00:15 am (IST). Where to Watch the Live Telecast of Manchester City vs Cardiff City, EPL 2018-19 Football Match? The official broadcaster of the English Premier League in India is Star Sports. So the fans will be able to catch Manchester City vs Cardiff City live match action on Star Sports Select 2 and Star Sports Select 2 HD channels. How to Watch the Free Live Streaming Online and Football Score Updates of Manchester City vs Cardiff City, EPL 2018-19 Football Match? If you are looking where you can watch the online streaming of the match, then you can log on to Star Sports' live streaming service, i.e. Hotstar. 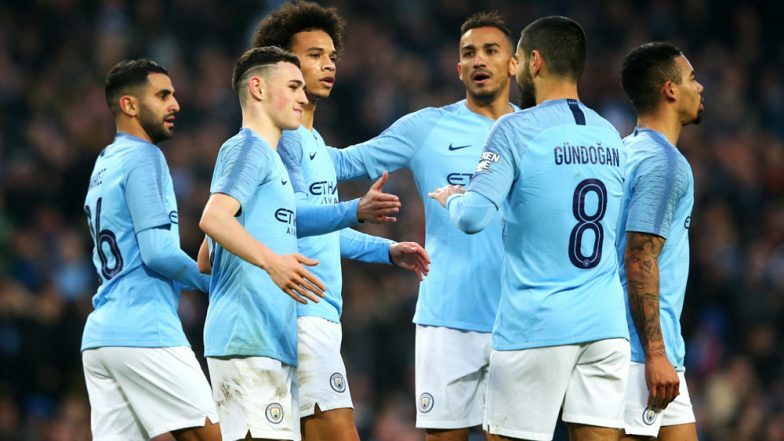 You can also catch Manchester City vs Cardiff City live football score updates on LatestLY, by clicking here.